To get the most out of your workouts, there should be no room for quitting in the middle of your sets or backing away from heavy weights. Make every rep count, lift heavier weights, and outlift the competition with the next-level clinically-dosed pre-workout formula from Nutrex... here comes Nutrex Outlift! Unlike most overhyped yet non-performing pre-workout formulas available today, Nutrex Outlift does not make use of proprietary blends in its formula. Every single ingredient and its dosage are fully disclosed on the label, ensuring that you get truly effective pre-workout support for your high-intensity exercise. 8g Citrulline Malate for boosting nitric oxide and arginine levels, increasing your workout endurance, delaying the onset of muscle soreness, and fighting muscle fatigue. 3.2g CarnoSyn Beta-Alanine to increase muscle carnosine and slow down the onset of muscle fatigue. BCAAs (Branched Chain Amino Acids) for protecting your muscles against excessive muscle breakdown, preserving your glycogen reserves, and increasing energy levels. 2g Taurine to prolong athletic endurance, decrease muscle soreness and keep your mind alert during exercise. 350mg Caffeine to improve your mood, boost your concentration, and promote the burning of excess body fats. 150mg N-Acetyl-L-Tyrosine, an amino acid that enhances cognitive function and promotes a positive sense of well-being. 5mg Bioperine to maximize nutrient absorption and utilization. Don't get intimidated by cold steel and heavy weights... break down all kinds of exercise barriers and make all your workouts count by taking Nutrex Outlift! Have a question about Outlift? What is it, what does it do, how and when to use or something else? Ask us. 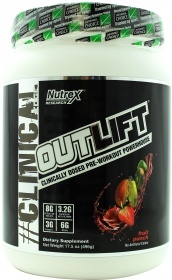 “Outlift 5 servings” is currently out of stock. Enter your details below and we will let you know when it's back in stock. Each flavor has a different total weight. The weight of each serving varies between flavors. To experience the full strength of clinically dosed OUTLIFT, mix 1 scoop into 240-360 ml of cold water and drink 30 minutes prior to working out. Limit use to 1 serving per day. WARNINGS Outlift : Contains a high amount of caffeine. Not to be used by pregnant or nursing mothers or children under the age of 18. Do not use if you are sensitive to caffeine-containing products. Too much caffeine may cause nervousness, irritability, sleeplessness, and occasionally rapid heartbeat. Stop use and seek medical help if you experience any of these symptoms. Do not exceed recommended dosage. Keep out of reach of children.